Happy Birthday Jean (Hans) Arp! Jean (Hans) Arp, born on September 16, 1886, was a well-known German-French sculptor, painter and abstract artist. the Dada art movement. The Dada art movement was founded in Zurich, Switzerland in 1916 as a cultural movement that involved art, poetry, theater, and graphic design. Dada was the “anti-art” and everything that art was to stand for, Dada was the opposite. Dada was the “George Constanza” of the art world. The Dadaist were disillusioned with what was happening to the world during World War I and Dada was a way for the artists to express the confusion that was felt by so many at that time. Arp had 2 reoccurring themes in his artwork: biomorphism and the idea of chance. Biomorphism uses rounded, organic shapes in its artwork. The notion of chance was supported by Arp created torn paper collages where the torn paper was scattered and glued onto the page wherever it landed. 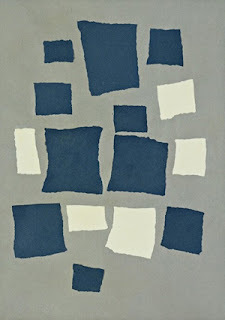 Untitled (Collage with Squares Arranged according to the Laws of Chance) is an example of this. The Dada artists wanted to create art that was spontaneous and pushed the boundaries of the previous art movements. Arp died on June 7, 1966 in Basel, Switzerland.